Divine Touches of Master: What is ShivYog? First let me put as to what ShivYog is not. ShivYog is not another religion, not another technique, not another method, not another practice. Babaji clearly states that he refers to Shiv as that infinite, which in different languages may be called as God, Krishna, Rama, Allah, Jehovah, etc. It is that same infinite power which is referred to as Shiv. Shiv means infinite and yog means uniting. So ShivYog is nothing but uniting yourself with the infinite. Babaji does not differentiate any other practice or any other gurus. He always stresses "Sab santh ek math" and "Naam anek, sab ka maalik ek" meaning names are different but God is one. It is babaji's vision to bring as many souls as possible with this infinite divine which one has forgotten due to the power of maya (illusions) and karmic factors. He teaches one how to merge with the divine. He teaches one how to heal your own self and others of physical, mental and emotional problems. He teaches one to dissolve one's own negative karmas, which one accumulates over different lifetimes and due to which there are sufferings and issues in the current life. Best of all is that there are no DOs and DONTs in ShivYog. Babaji only sets guidelines for all saadhaks (aspirant). So it is not surprising to find people of all kind, caste, creed, behavior, life styles, attending his shivirs to take on his easy teachings and easy-to-practice way of life. Babaji does not just give discourses but makes one fully experience what he is talking about and the experience is live. The healings are live. The transformations can be witnessed. The shedding of karma can be felt. The healing of problems are be experienced. Babaji also teaches one the art of manifestation and materialization where babaji emphasizes that one can bring in all the changes into what one wants in life. He suggests that you should enjoy (bhog) all that you have come to enjoy here only after which you can transcend higher. Babaji stresses on living life 200% - 100% materialistic and 100% spiritual. This is how one should balance one's life and make progress both in the physical world as well as the spiritual world. He teaches you how "You are the creator of your own destiny!" 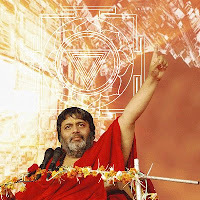 In ShivYog, there are 3 level courses, which one must attend step-by-step to be eligible for the next level. These three levels can be done in one Shivir (spiritual camp) that Babaji gets conducted and each shivir is for 9 days. During these nine days, Babaji carefully and slowly keeps one entertained with his jovial and wonderful sense of humor and shares the teachings of Holy Siddhas. As he is doing this, he blends it with sankeertan (chanting). He sings gloriously followed by all saadhaks and all his actions and words are very spontaneous. Sometimes he speaks in a very low and soft voice with a presence of divine wisdom of spirituality in his words. Sometimes his words are hilarious and reflect on practical experiences. Sometimes his words are stern and to-the-point. Whatever, he says, it all has a meaning at that point of time and he clearly reflects the divine's will of carrying out that message to the world. Saadhaks do experience this well. This consists of three days and babaji initiates one into ShivYog with beej mantra deeksha and also initiates one with Sanjeevani (the divine love and grace of Mahamruthunjaya). Once the initiation is done, Babaji then teaches one how to use this Sanjeevani shakthi to heal oneself and others. Deeksha takes time because Babaji ensures that he is present with each and everyone (nonphysically) for the deeksha. For some it happens spontaneously, for some preparation of cleansing is necessary which babaji knows and does accordingly. From here on, Sanjeevani, the divine energy, starts flowing from one's hands and fingers and can be directed to where the healing is required (close or distant). First three days, Babaji teaches one practically with some live sessions on healing. It is a great time for a saadhak who has been initiated and one starts feeling the changes happening with one's thinking including the physical changes. Normally one comes in with lot of skeptical questions in mind and some come in with lot of problems in life with restlessness but by the third day, most of the questions get answered and one starts feeling relaxed and comfortable. Completion of level 1 is mandatory for level 2. By the 4th day, a saadhak has sunk well into what is happening around. Babaji then initiates one with Shambhavi. Now, Sanjeevani upon invocation starts flowing through both the eyes and the third eye (between the eyebrows). Shambavi healing is very powerful and can be used to heal any sort of problem or issue. Till day 6 babaji continues with his divine message of unconditional love. By now one is a truly transformed person and one can really feel it. Babaji by 6th day has helped release many of the hard karmas and now asks the saadhak to continue doing sadhana until layer by layer all the karmic influences are dissolved. One leaves the 6th day being a totally new person. I would highly recommend the level 1 & 2 for all who are new to ShivYog and experience the wonders of self-transformation. Sri Vidya sadhana is for serious saadhaks wants to move towards moksha (liberation) Sri Vidya sadhana is the most sacred sadhana on Sri Chakra or Sri Yantra. A Sri Vidya Sadhak is blessed with abundance. Leading a very blissful and content life he quickly moves towards Self Realisation which is the Ultimate Reality. Sri Vidya begins where the Quantum Physics ends. It is the science of understanding the Microcosm and the Macrocosm. Babaji clearly explains this practice and gives the Sri Vidya deeksha, the highest deeksha in ShivYog. By practicing ShivYog on a daily one slowly but surely moves towards de-cluttering one's live of all problems and move towards liberating the soul from the cycle of life and death. Above shivirs are conducted by babaji, Guruma and son Ishanji. Another major course undertaken by Shri. Ishanji is Prati Prasav Sadhana, where one's karmic influence of present sufferings are traced back to either old incidents of the present life, womb state or past lives. ShivYog site says, "Your present is a reflection of what you did in the past. If you are unhappy it indicates unresolved issues in this life or the past life. One must resolve these issue so that they do not enter into similar circumstances again and again and also so that they do not carry the same circumstances to their next birth. This unresolved issue is what is called Samskars or Sanchit Karmas by our scriptures. The circumstances & the problems one is facing is due the stored baggage of Psychic Impressions that one has collected in various lives and this life starting from the mother’s womb. To release the suffering, pain or disease of present life or to attain the higher level of spirituality & the Ultimate Truth one has to release the Sanchit Karma or Samskaras or Psychic Impressions. Siddha Past Life Therapy teaches how to shed this heavy load and bring out the inner light in the form of health happiness & prosperity. This is the ancient wisdom & sadhna that was practiced by Maharishis such as Gautam Buddha and Mahavir. A small fraction of this knowledge also went to the West from India and there they practice it as Past Life Regression. We are extremely lucky that we have the opportunity to learn the complete wisdom of Prati Prasav Sadhna." This can be attended by one who has not attended any other courses also. Prati Prasav is now being conducted at various places by Shri. Ishanji. Overall, Shivyog gives one a complete overhauling and helps one detoxify and shed the baggage that one has held on to for so many life times and start life afresh with a new direction. At the current time, the sequence and format of the shivirs have changed and Babaji is doing more of Sri Vidya Shivirs, the basic levels being conducted free of cost. For more information on registration and course details please click here.